Abstract: The medieval Black Death (c. 1347-1351) was one of the most devastating epidemics in human history. It killed tens of millions of Europeans, and recent analyses have shown that the disease targeted elderly adults and individuals who had been previously exposed to physiological stressors. Following the epidemic, there were improvements in standards of living, particularly in dietary quality for all socioeconomic strata. This study investigates whether the combination of the selective mortality of the Black Death and post-epidemic improvements in standards of living had detectable effects on survival and mortality in London. Samples are drawn from several pre- and post-Black Death London cemeteries. The pre-Black Death sample comes from the Guildhall Yard (n = 75) and St. Nicholas Shambles (n = 246) cemeteries, which date to the 11th–12th centuries, and from two phases within the St. Mary Spital cemetery, which date to between 1120-1300 (n = 143). The St. Mary Graces cemetery (n = 133) was in use from 1350–1538 and thus represents post-epidemic demographic conditions. By applying Kaplan-Meier analysis and the Gompertz hazard model to transition analysis age estimates, and controlling for changes in birth rates, this study examines differences in survivorship and mortality risk between the pre- and post-Black Death populations of London. The results indicate that there are significant differences in survival and mortality risk, but not birth rates, between the two time periods, which suggest improvements in health following the Black Death, despite repeated outbreaks of plague in the centuries after the Black Death. Introduction: The Black Death was one of the most devastating epidemics in human history. It was the first outbreak of medieval plague in Europe, and it killed tens of millions of people, an estimated 30–50 percent of the European population, between 1347–1351. This massive, extremely rapid depopulation event initiated or enhanced social, demographic, and economic changes throughout Europe, and thus has attracted the interest of a variety of researchers for decades. Previous bioarchaeological research, using individuals buried in the East Smithfield Black Death cemetery from London, examined the selectivity of Black Death mortality, i.e. 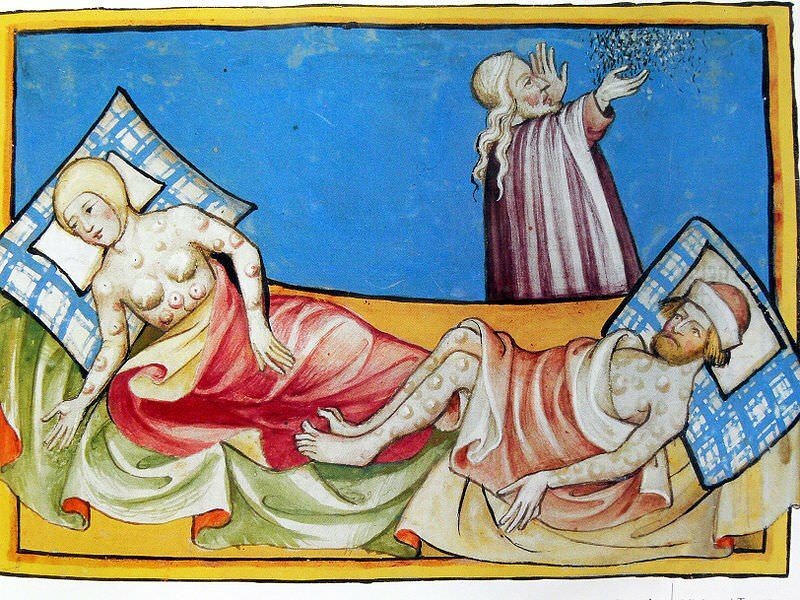 whether the medieval epidemic targeted particular individuals or whether, as is often assumed given its very high mortality levels, it killed indiscriminately. The results of this research indicated that people varied in their risks of dying during the Black Death. In particular, older adults appear to have been more likely to die during the epidemic than their younger peers. Analysis of skeletal markers of physiological stress (short adult stature, enamel hypoplasia, tibial periosteal lesions, cribra orbitalia and porotic hyperostosis), which have been shown under conditions of normal, non-epidemic medieval morality to be associated with elevated risks of mortality revealed that people of all ages (not just the elderly) who were already in poor health (i.e. those who had been exposed to physiological stressors and had developed skeletal stress markers as a result) before the Black Death subsequently faced higher risks of death during the epidemic than their healthier peers. Thus, despite its incredibly high levels of mortality, the Black Death was, like most normal causes of death, a selective killer.